Hedley the Robotic Skull and I were in Minneapolis, last week presenting our talk at the Embedded Systems Conference. The event was a mix of embedded computing, manufacturing and medical technology. There was an estimated 5,000 attendees there, along with over 500 exhibitors. 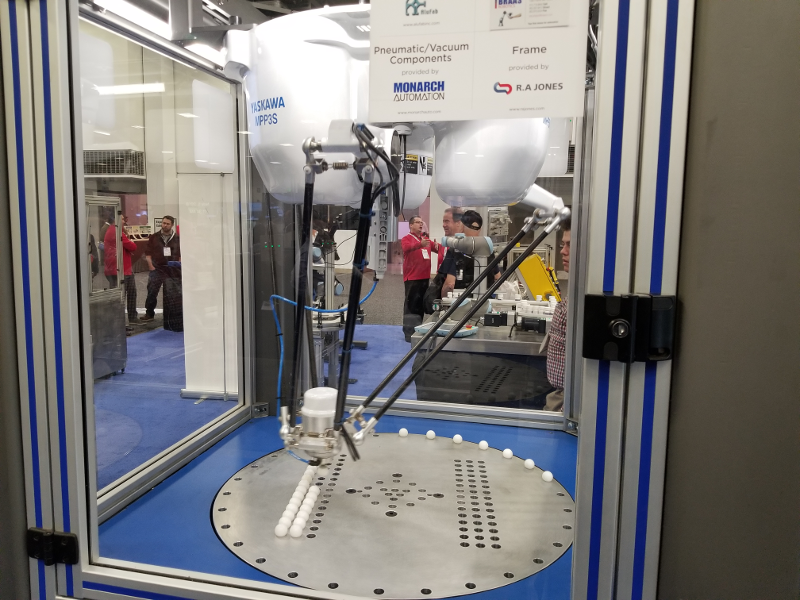 The show floor was absolutely overflowing with all manner of robot arms, miniature printed metal parts, manufacturing machines, and various small automated gadgets in every direction. 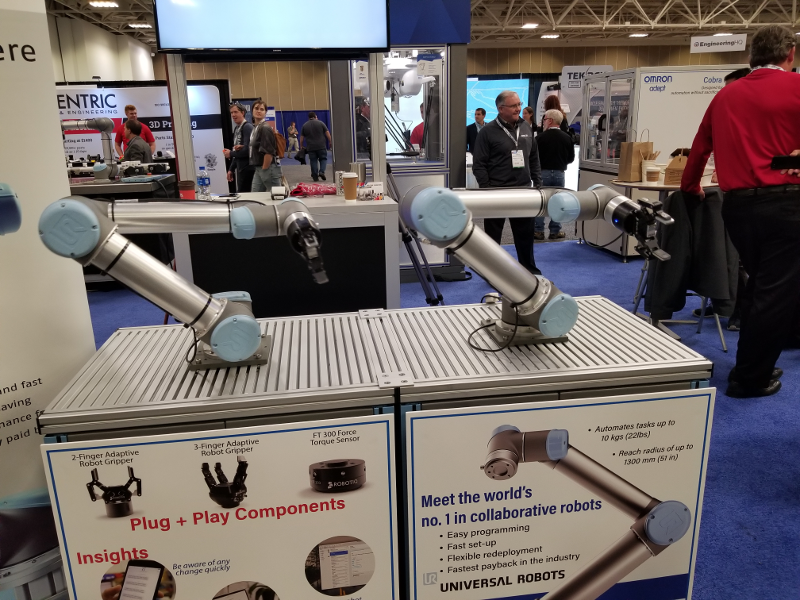 This surfeit of embedded tech is not surprising: Minneapolis is a hub for manufacturing and the medical industry, many of which were regional or local. Our own presentation went pretty well. Hedley’s jaw moved with the scripted phrases I recorded for him and he was able to easily track me around the stage, using the Aruco marker taped on my lapel. LibreOffice Impress performed flawlessly for the slides. luvcview, the viewer program I wanted to use to give a first-person view of what Hedley saw through his JeVois machine vision sensor didn’t cooperate, however. We ended up just reverting to Q&A to finish out our session. There were a couple of dozen audience members and quite a few questions about Hedley’s construction. Overall, I think the audience liked Hedley and his story. I left the bulky ASUS Linux laptop at home and used my Galaxy 8+ phone for email and communications. I didn’t really miss the laptop too much. The time frame was condensed, with me leaving at 7 a.m. on Tuesday and arriving back at home in Orlando on Thursday at 8 p.m. There wasn’t much time to fiddle with a laptop anyway. I picked up a few new techniques that readers will find useful for their next hardware-oriented physical computing tech talk. Last July, Hedley traveled as checked baggage for the Portland trip. This time I upgraded him to carry-on status because he absolutely had to be in Minneapolis for the show. You can’t do a presentation if your robotic assistant didn’t make it through your layover stop (and plane change) in Detroit. How do you figure out what goes in your carry-on? Simple. Pack only what you’ll need for your talk. Put everything else in your checked baggage. I did a full dress rehearsal including Hedley operating on his tripod, the day before the trip. When finished, I simply took all the equipment I used for the rehearsal and neatly packed it into Hedley’s travel box, along with Hedley, of course. The parts list included the wall wart for the USB hub, the wall wart for the Raspberry Pi, the three-foot-long HDMI cable, the Logitech keyboard/mousepad and the three-button wired clicker. Although I didn’t use it I also stuffed the 10.1-inch LCD display, the driver board and a small 12-volt wall wart into the travel case. The LCD panel runs on 12 volts. There was also room for my Generation-5 steampunk conference badge, a micro keyboard and a two-port 2200 mAh power pack. It made sense to put Hedley on a stand so audience members would have a clear view of him during our performance. I had purchased an ultra lightweight poster stand secondhand from Goodwill and thought I’d build a little bracket so Hedley could sit on top. The tripod didn’t fit in his carry-on box or my checked bag. I thought about shortening the legs on the poster stand so it could go in my check bag. As it turned out I instead used my old camera tripod. It was short enough to fit in my suitcase and didn’t need any mods. Weight was a concern though because Spirit Airlines had a 40 lb. limit on checked bags without an extra charge. I packed everything for my trip in the checked bag, including the camera tripod and hauled it to the scale inside the front door at Publix Supermarket, to check the weight. Total weight was about 30 pounds. Hedley and his carry-on tipped the scale at about 15 pounds, so everything was good. Hedley could always sit on top of the lectern if the tripod went missing in the airline baggage Ether. You would think a bunch of cables, a robotic skull, and a funky steampunk-ish travel case would draw attention going through airport security. Nope. I put Hedley in his case and the cardboard box with our top hats on the x-ray belt and it all sailed through without a peep. That was in both directions by the way. Perhaps my clean shaven, short haircut, shorts and T-shirt look did the trick. You never know. In summary for a hardware-oriented tech talk, just pack what you’ll need for the presentation, in a carry-on bag to make sure you can do your show. Put everything else in a wheeled checked bag. You can present in what you are wearing if your checked bag doesn’t make it to the venue in time. I arrived at my designated speaking location about one hour before my start time. The area was called the “Engineering HQ” and was a slightly raised platform at one end of the convention hall. It had microphones, a podium and a table for panel discussions. Audience members sat in front of the stage. Unlike regular conference sessions that take place in rooms with doors, this area was open on the sides and back so conference goers could come and go at will. There was a curtain wall that separated the Engineering HQ area from the adjacent booths. I took the liberty of setting Hedley up on his tripod, behind the curtain so as not to interrupt the talk that proceeded mine. I also connected the wall warts and put Hedley’s hat on his head. When our show time arrived, I just picked up the tripod, with Hedley on top, placed him on the stage and hooked him up to power and the HDMI connection. I strongly recommend pre-staging your hardware and gear if possible, when giving a tech talk. The previous speaker went long on his time so I only had about five minutes to get everything ready. Brian, the board tech miked me up and we tested Hedley’s voice through the HDMI cable. Worked like a charm on the first try. I was a little concerned about the thick HDMI cable so we duct taped it to the tripod, to keep the strain off of the connector on the Raspberry Pi. Redesign of Hedley’s cable routing is definitely now on the to-do list. Rehearsing a few times, in costume and as close to your actual show environment as possible will point out problem areas, that you wouldn’t otherwise anticipate. It will also show you the bare minimum you can take with you to successfully do your presentation. Everything else is just extra weight you’ll have to haul around and worry about. Streamline, while covering likely contingencies as much as possible. The trip to Minneapolis was successful and I think audience members learned a few things about how to build a robotic skull with embedded physical computing technology. Hedley performed well, although we still need a more robust operation of the smart vision sensor video feed. The only practical way to flush out the problems with physical computing devices is to build and test. Testing in front of an audience certainly focuses your efforts. Rehearse, remain calm and have some alternatives in case something goes belly up. Then just go huge or go home. Note: The Embedded System Conference paid for Dr. Torq’s hotel, airfare, and conference pass. 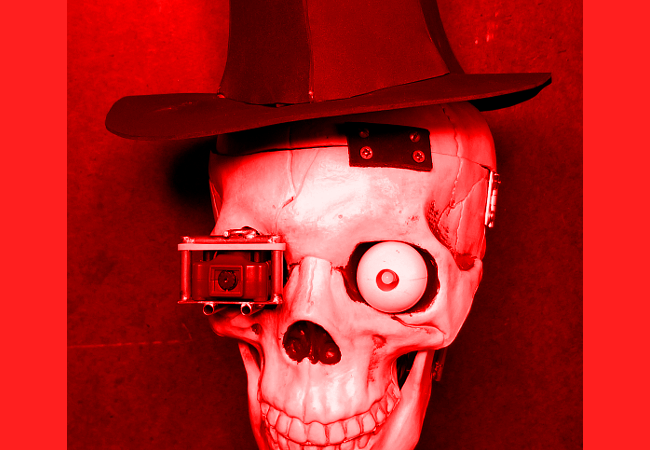 The post Off-The-Shelf Hacker: Hedley the Robotic Skull Spooks Minneapolis appeared first on The New Stack. Previous: Previous post: Angular Project? Let’s learn Angular!